Kouřim is a historical city located 45kms east of Prague. 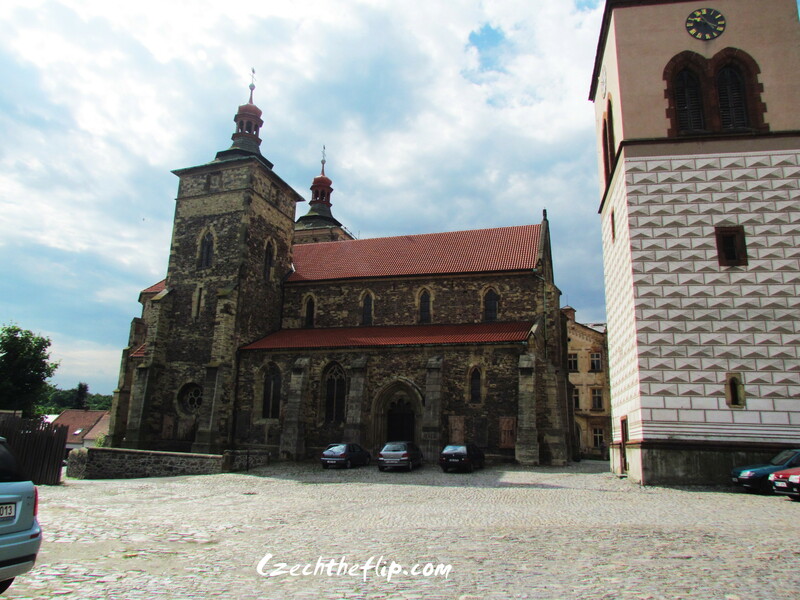 During the 13th to the 16th century, it used to be one of the most important cities in Bohemia. The first 300 years of existence of Kouřim as a city experienced bloom and prosperity that was seriously untouched even by the Hussite wars. In 1421, it surrendered without a fight to the approaching troops to remain spared. The end of the Hussite wars and the subsequent secularization of church property brought a huge economic boost to the city. 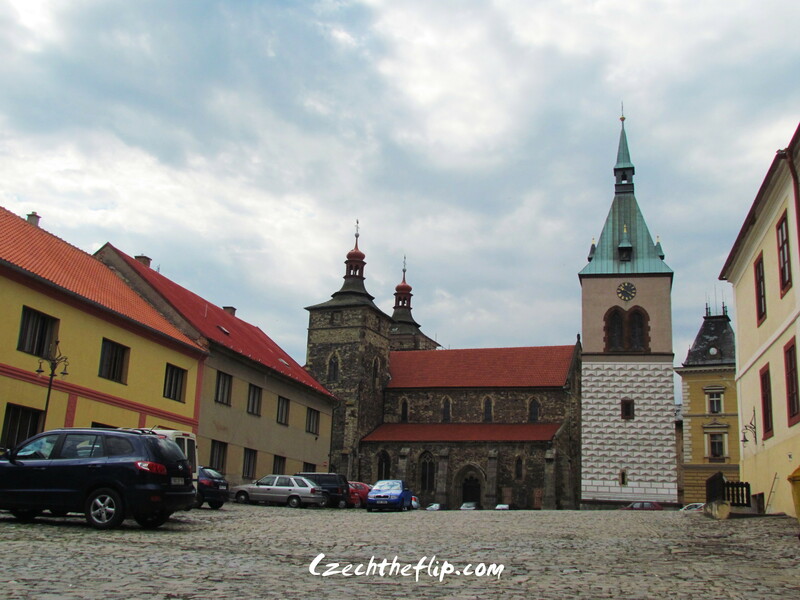 At the turn of the 15th and 16th century, Kouřim stood in the zenith of power and wealth. The first harbinger of the end of the “golden age” of the city was the year 1547, when Kouřim actively participated in the rebellion against the Emperor Ferdinand I of Habsburg. But that was suppressed and the town suffered severe punishment in the form of economic sanctions, especially the confiscation of almost all of its landed property. Horrible disasters followed including the Thirty Years War where the city was repeatedly looted by passing troops. Although in 1648 the Peace of Westphalia ends the greatest horrors, it is unfortunate that at the end of the 16th century, it was further decimated by religious oppression, plague and a series of fires. 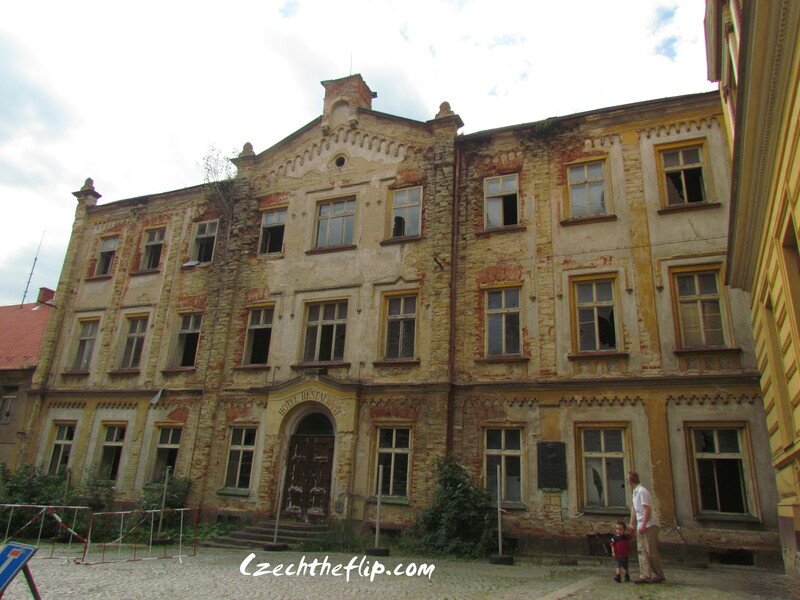 Today, Kouřim stands as a favorite destination for history lovers. Relative to the size of the city, it has a pretty big town square. 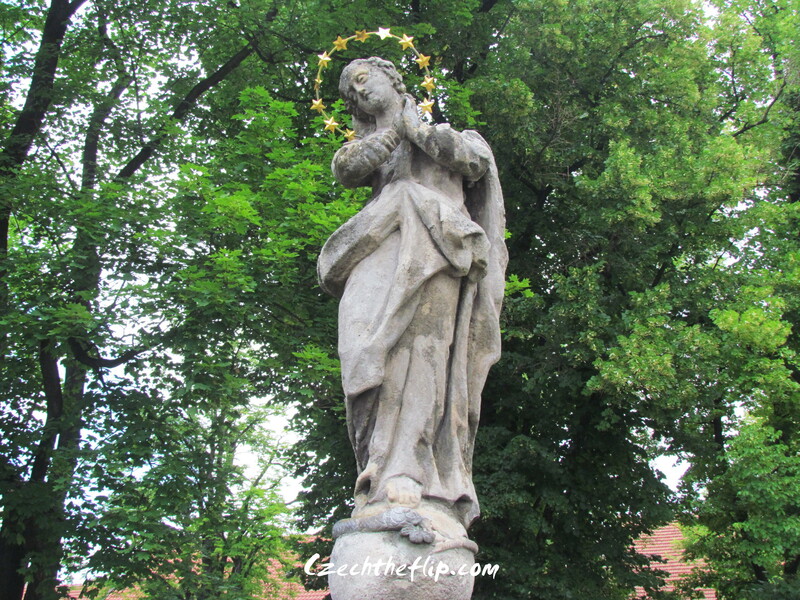 In it is found the Statue of the Virgin Mary which was built in 1850. 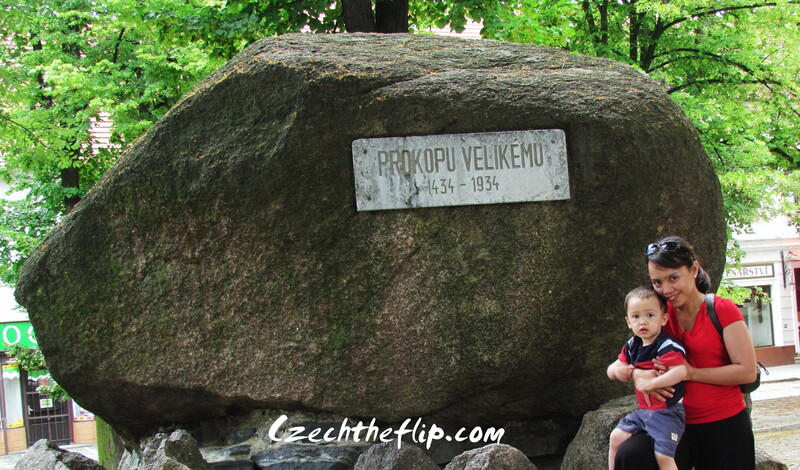 Also found in the square is a huge rock, called Prokopu Velikemu to commemorate the battle of Lipan. 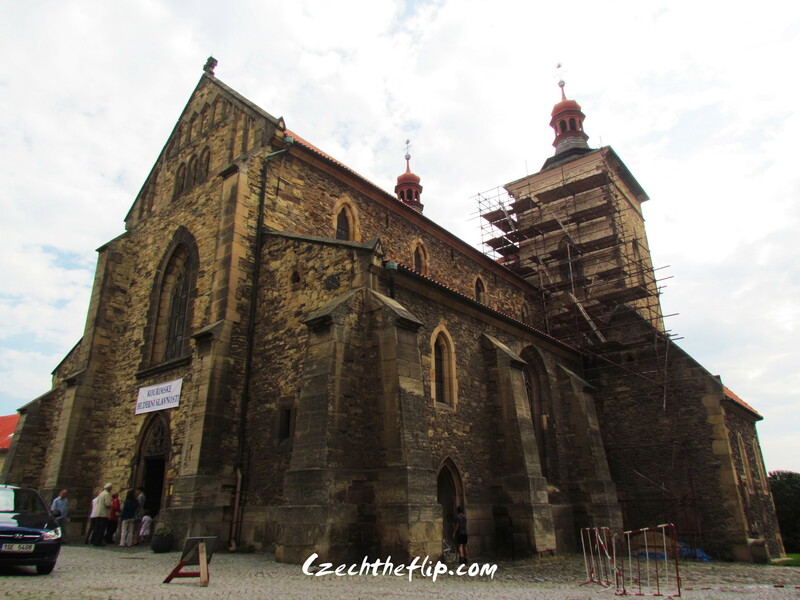 But perhaps the biggest attraction in Kouřim is the Church of St. Stephen, which has a unique Romanesque Gothic style, and is one of the oldest churches in Europe, built sometime during the 13th century. 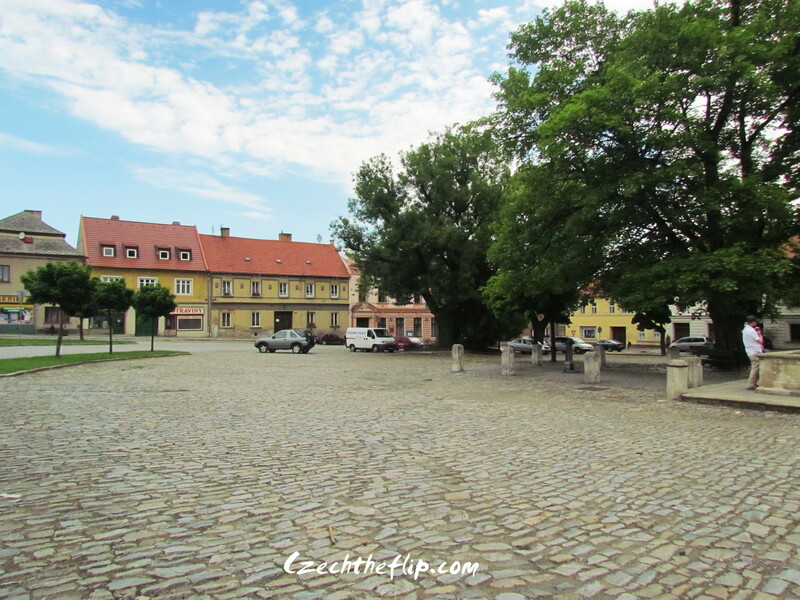 So if you are visiting the Czech Republic and would love to know more about its history, Kouřim is definitely a “must see” spot for you. It was a little bit rainy today, so Jakub and I stayed indoors through most of the day. Since it’s Thursday, and we normally do shopping on Fridays, the food supply in our household was quite depleted. He already ate up his favorite snack. Thus, supermama had to make something for this picky little eater. I checked out the cupboard to see what I have and was lucky to find that I had flour, milk and eggs – the main ingredients for palačinky. Out of all the Czech foods I’ve ever tried to make, palačinky is my favorite. Not only is it very easy to make but it is also very flexible. 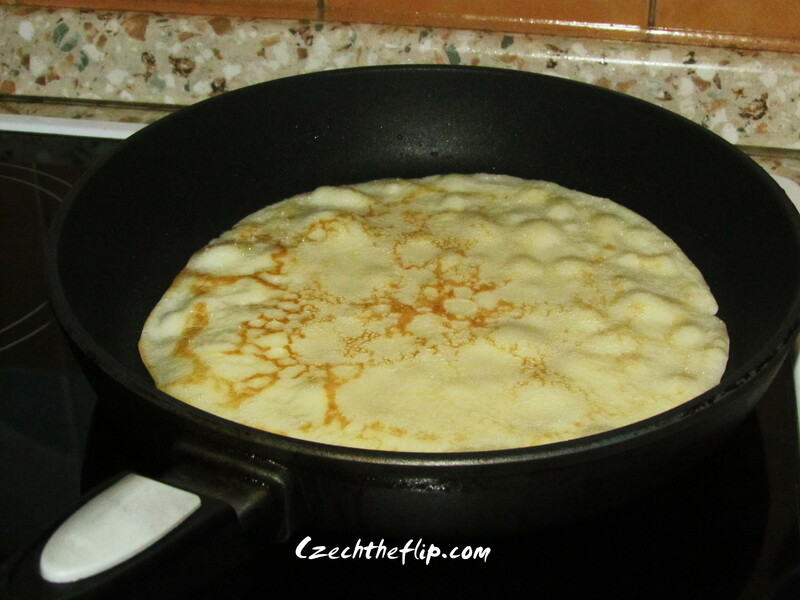 Palačinky is a thin pancake very similar to French crepes. It is very popular in Czech and almost every housewife knows how to make it. Palačinky is normally eaten with jam/jelly as a filling. It can also be made fancier with whipped cream on the side and chocolate syrup drizzled all over it. It can even be made as a main course when it is stuffed with meat and veggies. 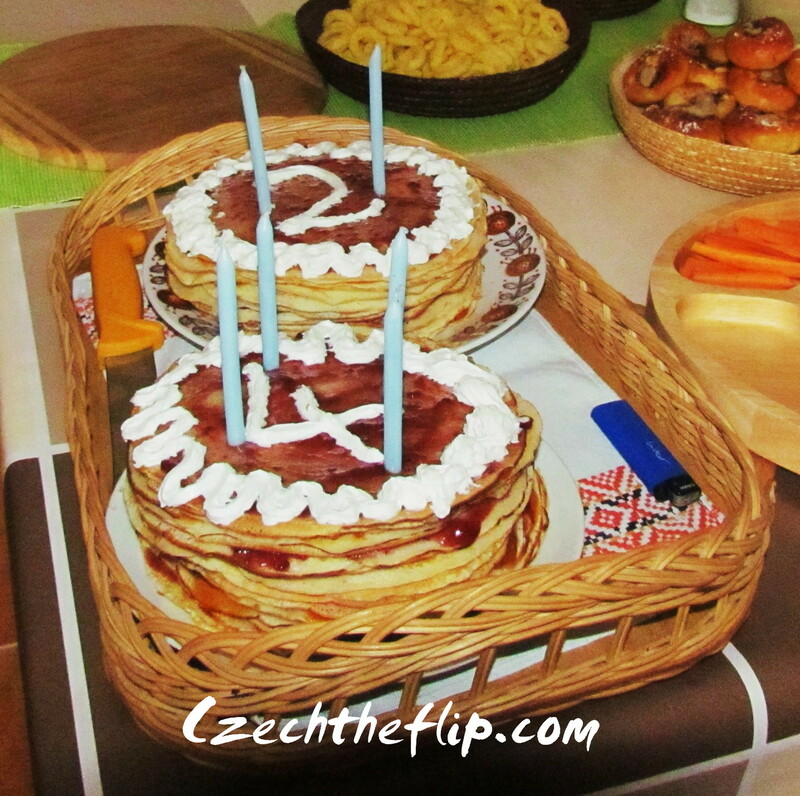 But the best palačinky variation I’ve ever seen was at my in-law’s house where it was made as a birthday cake. I thought that was pretty innovative. It was very simple yet delish. I would never have thought to make it for that purpose. Procedure: Mix all the ingredients together. Pre-heat a cooking pan. Add a little bit of oil to prevent the dough from sticking to the pan. (If you are using a non-stick pan, there is no need to add oil.) Take 4-5 tablespoons of the mixture and spread evenly on the pan. Turn when the sides turn brown. Whatever the occasion, whether it is a simple afternoon snack, a main course or a party, rest assured that palačinky will always save the day. I had been offline this past weekend, but what greeted me when I got back online was this award. I had the honor of being nominated by Afternoon Popcorn Snack and The Blazing Trail for the One Lovely Blog Award. My sincerest appreciation to you both! 1. I made 18 significant moves so far. 2. I can play the bandurria, a plectrum chordophone from Spain, primarily used to play folk music. When I was 14, my mom enrolled me in a bandurria class to give me something to do during the summer. 3. I like putting hotdog as a main ingredient in my spaghetti. Sliced, of course. 4. When I was a child, I used to walk 1km to school every single weekday. 5. On my first year at the university, I, together with almost 300 other students, was a victim of a food poisoning outbreak at the dormitory cafeteria. 6. I used to have a cat named “Tiger,” because he looked like one. 7. When I was pregnant with my son, I ate 2kgs of dill pickles in one week. Now for my nominees….in no particular order. Please do check out these blogs. I hope you enjoy them as much as I do. There are Czechs and there are “Czechs”. If you want to distinguish a true blue Czech, you have to be in the lookout for their bread preferences. A true Czech will always look for Chleba. Chleba is a sour dough rye bread, dark in color and moist. It has a distinct unique taste to it that is very different from any other bread. Through all those years that we have spent in the US, my husband never got satisfied with the kind of bread that was sold in the stores there. He was always saying that it is nothing like Chleba. Apparently, the same is true for some of the other Czechs that I know. My brother and sister in law, both Czechs, had to bake their own chleba from scratch when they lived in North Carolina. They missed it THAT much. 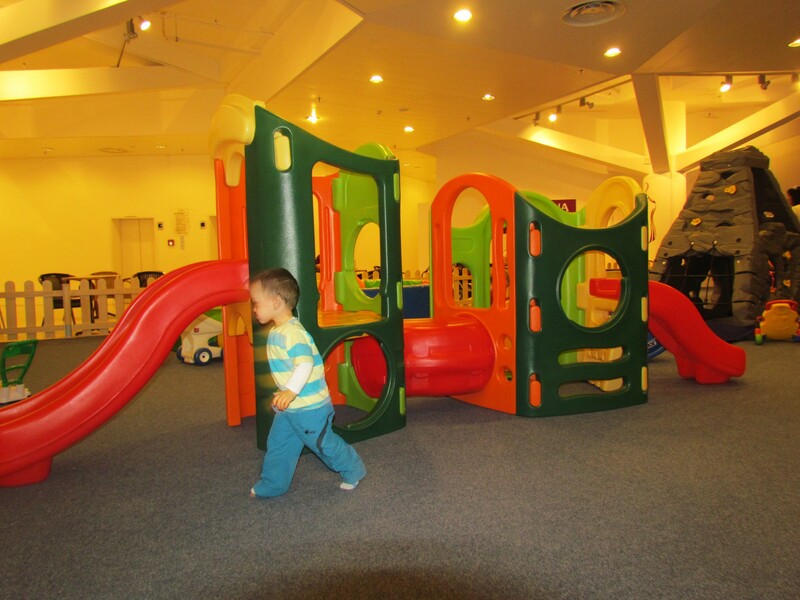 Last Wednesday, Jakub and I went to the Kuliskov children’s play area in Prague to meet some friends. 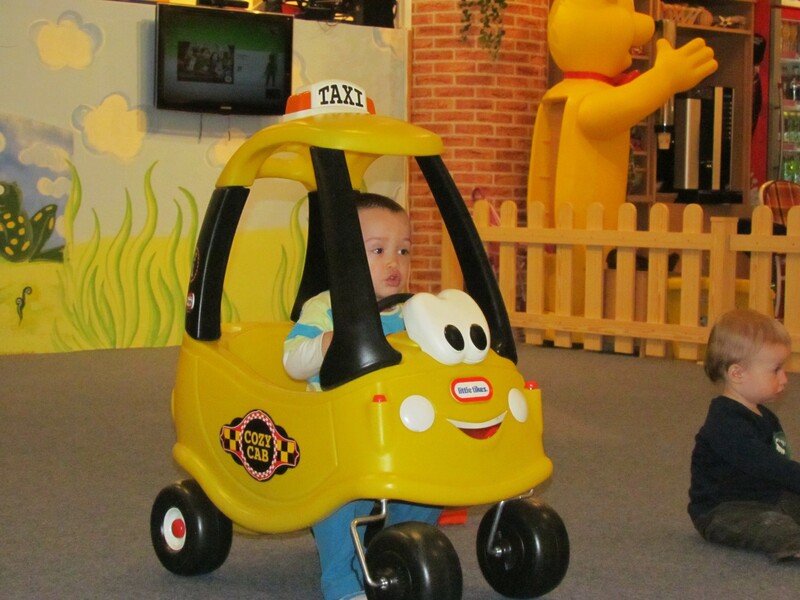 Since he doesn’t go to these places that often, Jakub was totally enthralled. 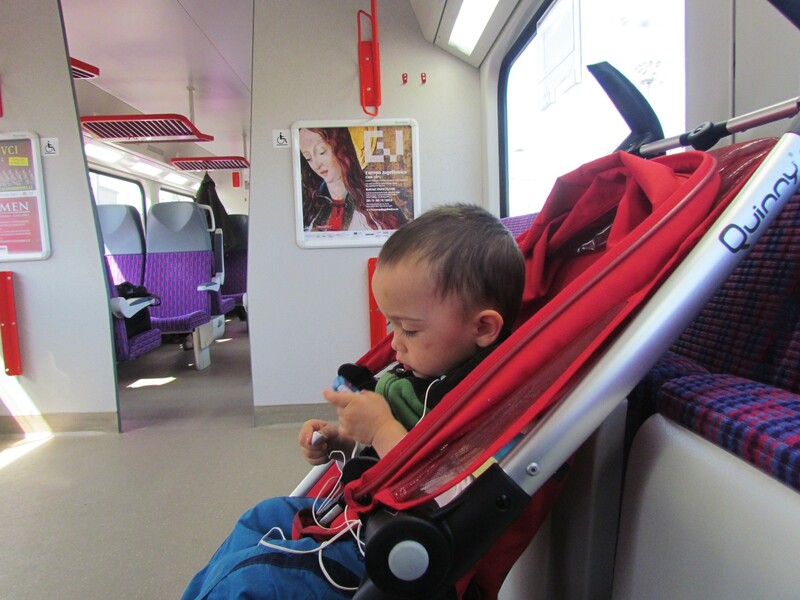 On the train to Prague, it was quite difficult to keep him in his seat. Although not a very good idea, I allowed him to play with an mp3, if only to keep him still. Tinkering with the mp3 on the way to Prague. 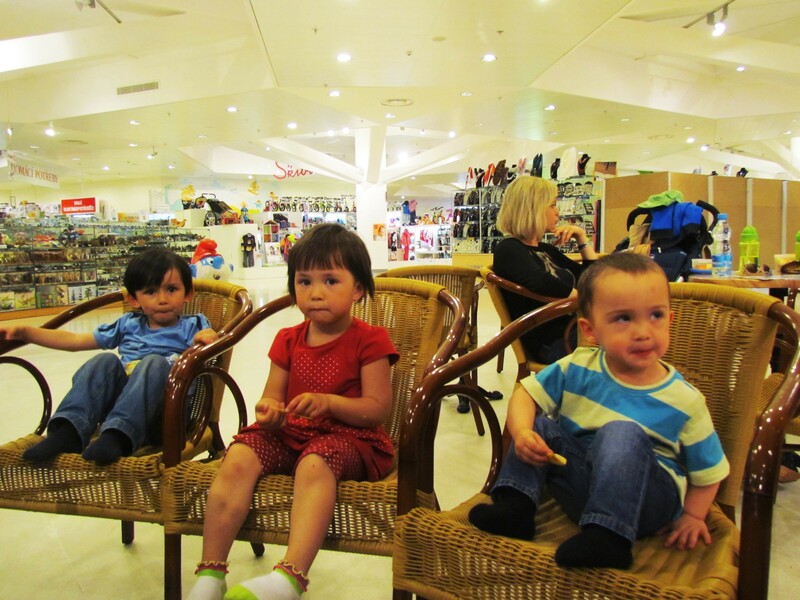 We met with 2 of my Filipino friends who are also married to Czech nationals. When we got there, Jakub totally forgot about me. He immediately rushed to the toys. I could leave him there and he wouldn’t mind. 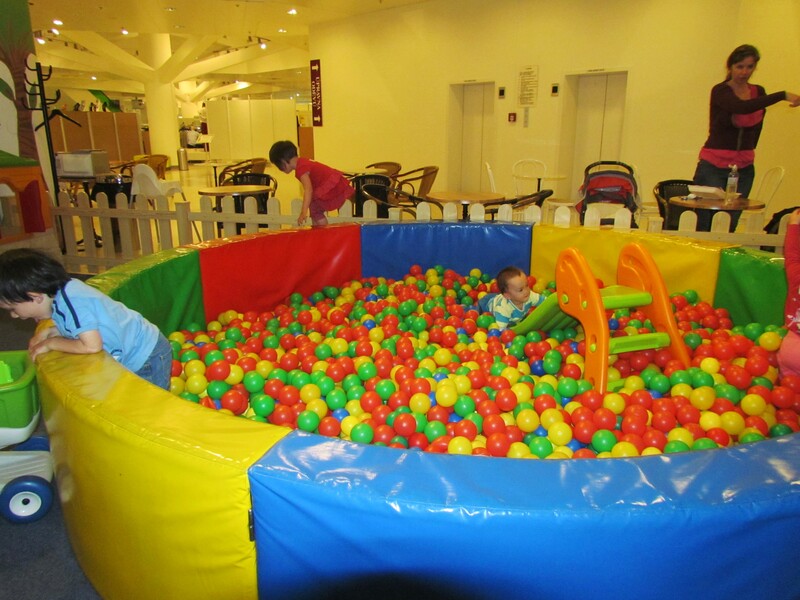 It was very difficult to keep the children still. Thus, a group picture was close to impossible. This is the closest photo that I got with all 3 of them sitting still. We tried placing them inside this enclosure, but look at what happens. Somebody always has to leave. Raising a child is not easy. But it is always nice to know that one is not alone in this journey. The meeting went very well and I am hoping for future get togethers with more moms and their kids. 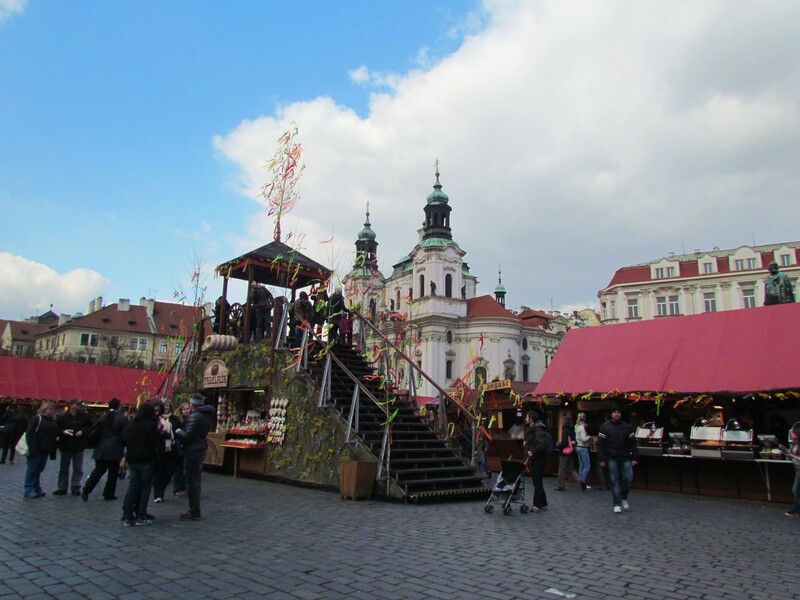 Next to Christmas, Easter is the biggest celebration here in Czech. Although there a number of Christians in the Czech Republic, its is not a serious religious celebration. Easter is now limited to the beginning of spring since during the Communist era, its religious connotations were suppressed. The other day my husband asked me to buy a whip for my son. Yes, a whip(pomlázka). Not to whip him, but to whip me. It is a long held tradition over here for men/boys to whip the women during Easter. It is believed that whipping chases away illnesses and bad spirits and bring health and youth for the rest of the year to anyone who is whipped. In return, girls reward boys with a painted egg, or a candy. Since it will be our first Easter here, we are celebrating it with my husband’s family. 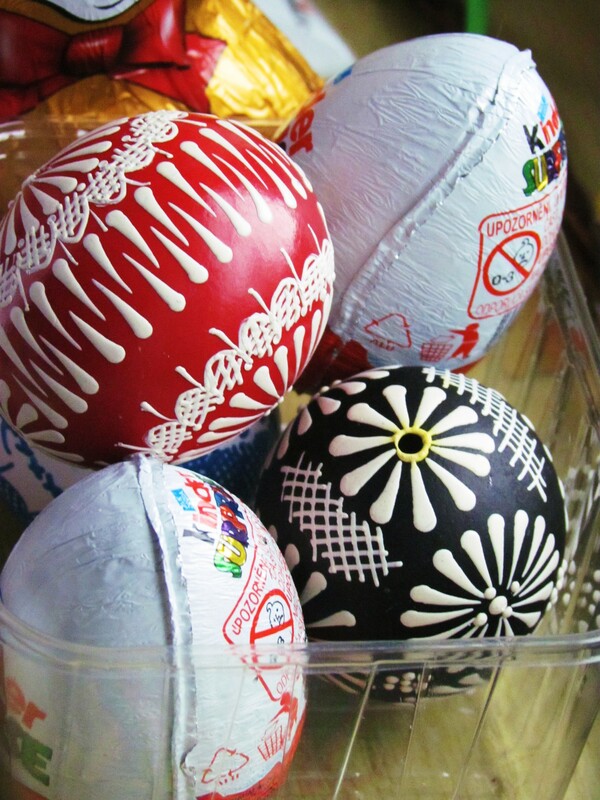 I do not know how to make a whip or hand-paint eggs so I bought them from the Easter market. Easter markets are also very popular over here. Like Christmas markets, you get to see crafts and food items sold in the stalls. The atmosphere is generally festive and both locals and foreigners flock these markets. In my husband’s family, boys outnumber girls. I expect a lot of whipping and a lot more eggs. When my husband told me about this tradition, I thought it was weird. It gets even weirder when Easter Sunday is actually celebrated on Monday. I am a chocoholic. If there’s anything I love as much as rice, it’s chocolate. 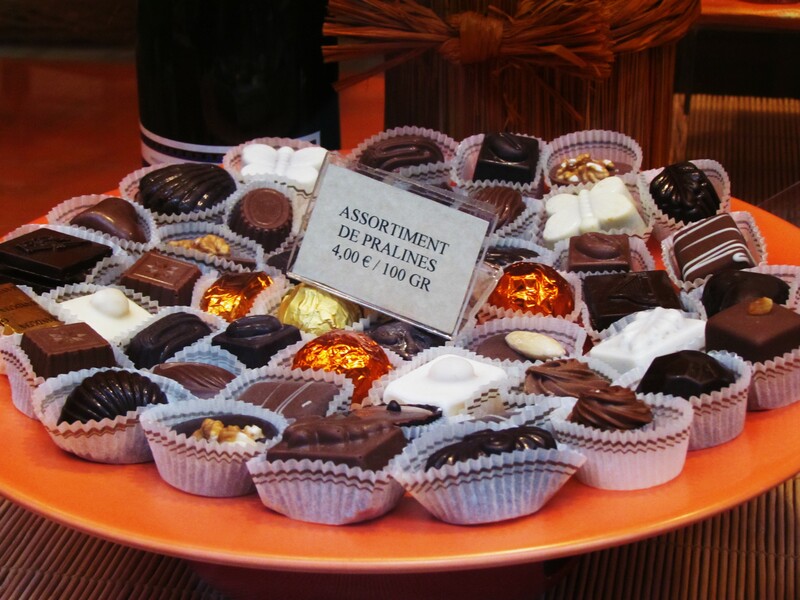 Before coming to Czech we had to drop by Belgium, so I had a good dose of Belgian chocolates while we were there. Now that we are here in CZ, I decided to try the local brands. So this is what you will find in our cupboard. 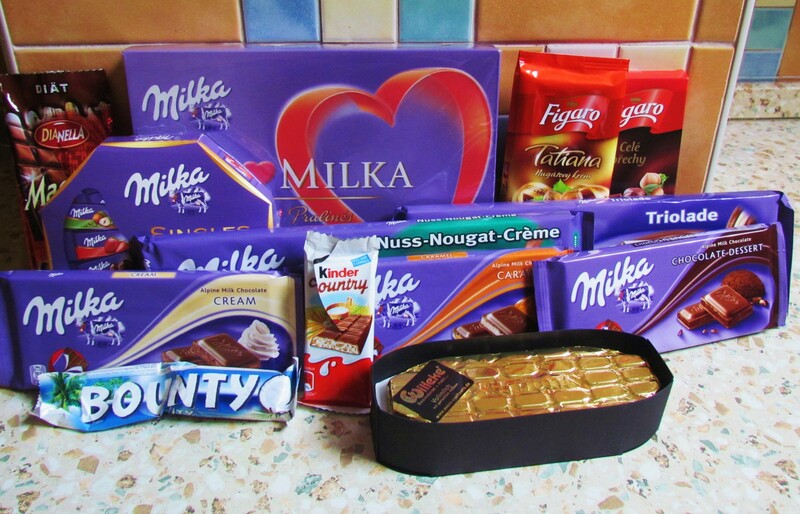 Yes, I am a big Milka fan. 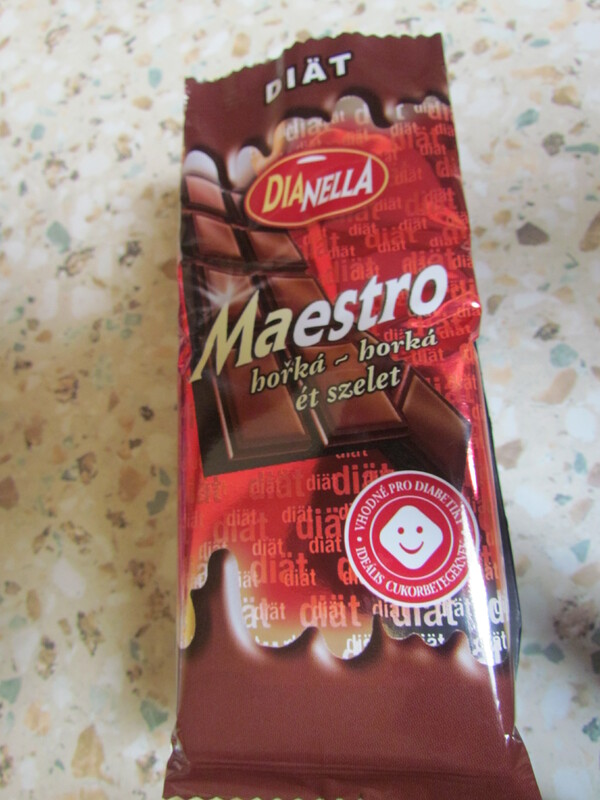 I think it’s one, if not the best, chocolate here in CZ. And here’s one that’s purely local —as in Kolin local. It is a chocolate for diabetics though, but it doesn’t taste too bad. It’s good for dieters too. When I used to work at Hostess, I thought I was in heaven when during the plant tour I saw the chocolate fountain used to enrobe the baked goods. I thought to myself, “so I get to taste that everyday? pure awesomeness!” They told me I will get tired of it after some time. But in my case, it’s not really true. To this day, I still miss having to do daily product scoring with our chocolate hohos.